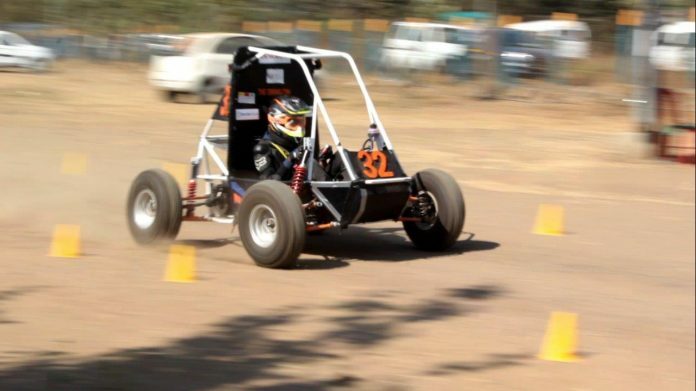 Mahindra Ecole Centrale(MEC) students added another feather in their cap, when they launched their first completely indigenous All Terrain Racing Vehicle. The Oranguan, or the first off-road racing ATV, has been totally envisioned, designed, built and rigorously inspected by the students of MEC. Created by the students of Team Gas Monkeys Racing, the competitive arm of MEC SAE club (Society of Automotive Engineers). The members of the MEC SAE club are required to be members of SAE India and formally join the MEC SAE club following a rigorous, formal induction process including a quiz on the SAE racing rule book, followed by an interview. The racing team comprises of some of the most dedicated and hardworking student members of the MEC SAE club and is a collaboration of several teams working on Suspension, Engine and Powertrain, Steering, Brakes, Electronics and Marketing and Finance. These teams work together tirelessly to first design a car virtually, and then manufacture the designed vehicle to burn rubber on dirt! The team unveiled MECs first Orangutan and cleared rigorous technical inspections, taking part immediately in a grueling 4 hour endurance race – A significant achievement for a first year team! The team is looking forward to building their second Baja buggy for the 2020 season, intending to make it even lighter, stronger, tougher and faster. Mahindra Ecole Centrale(MEC) college of engineering is an international technology school, that marks the foray of the USD 20.7 billion Mahindra Group into the higher education sector. Mahindra Educational Institutions, the wholly owned subsidiary of Mahindra Group’s IT venture, Tech Mahindra, collaborated with Ecole Centrale Paris – now Centrale Supelec – in 2014, to establish MEC in India. Ecole Centrale is one of the oldest and most prestigious engineering institutions in France with a heritage that goes back to nearly 200 years. MEC is approved by AICTE and Jawaharlal Nehru Technological University (JNTU) Hyderabad, a premier institution with academic and research-oriented courses. MEC offers a truly international programme with an inclusive focus on the Engineering, Social and Creative sciences, Liberal Arts, Philosophy and Humanities. It offers an environment of unique cultural immersion – of participants, faculty and staff. MEC offers international global internship and placement opportunities to its students. The B.Tech degree at MEC is a research-driven program with close links to industry. A world class faculty, with a mix of rich industry-academic background, global exposure and research focus ensures that the content remains contemporary, aligned to the global business requirements. Based in Bahadurpally, Hyderabad, MEC is situated in a sprawling green campus of nearly 126 acres flanked by the Tech Mahindra Technology Centre and Tech Mahindra SEZ.